Storytelling + Research = LoiS: The Burning of Washington, D.C.
On August 19 I caught a show on National Public Radio worth sharing with everyone. Breaking: British Burn Washington is done in the style of breaking news from the battlefront with various correspondents and even debating "experts" about whether the War of 1812 should have been undertaken. (If the NPR link is confusing because of other current news archived with it, be sure to look for "Breaking.") Two hundred years ago the young United States fought this "Second War of Independence" from Britain. NPR was a bit premature as the date was August 24 according to everything I have found. The War of 1812 is often overlooked among other U.S. conflicts, so the Bicentennial reminds us just how close we came to losing. Listening to the program it was easy to imagine the horror of that historic day. My own historical programs look at "History as seen by the 'average' person" as opposed to the many people who portray famous people. If anyone famous would entice me, it's Dolley Madison. Back when I did three articles specifically on the War of 1812 I mentioned her in 12 Reasons to Remember the War of 1812 (reason 9), but 13 Resources to Remember the War of 1812 (resource 10) took us to pages 14 to 17 of "The Burning of Washington" by Anthony S. Pitch published in White House History (Fall of 1998), an article that also gives a "You Are There" feeling to how the day went. 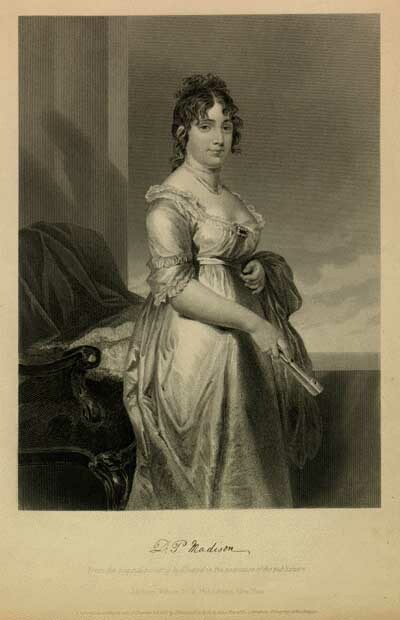 For some unusual facts about this special First Lady and a sidebar taking you to resources about her, I recommend the FAQ page of The Dolley Madison Project. Hearing the radio program, with it's excellent feeling of being in the midst of the burning of Washington, it hit me: I've ancestors named Dolley! I ought to look and see how close to the war years they were born. That sidebar I mentioned includes a page about her name and makes me more convinced than ever her name was chosen by members of my mother's family because of Dolley Madison. She wasn't Dorothy or Dorothea, no matter how much others might try to make her that. She was Dolley. So were they. It wasn't a nickname, nor was it Dolly. Engraving of Dolley Payne Madison done in 1812 by ?William Chappell. Prints and Photographs Division, Library of Congress. Here in Michigan The Michigan Commission on the Commemoration of the Bicentennial of the War of 1812 has resources to know more about it's impact here. Wikipedia has a page of links to both Canadian and State Bicentennial resources. The final page of Anthony Pitch's article discusses looting after the burning of the President's House (not yet called the White House) and the Capitol. Looking at other news on the N.P.R. archive of the same day, looting and international threats against the United State are in the news. There are many quotes about history repeating itself. General Patton said: Prepare for the unknown by studying how others in the past have coped with the unforeseeable and the unpredictable.